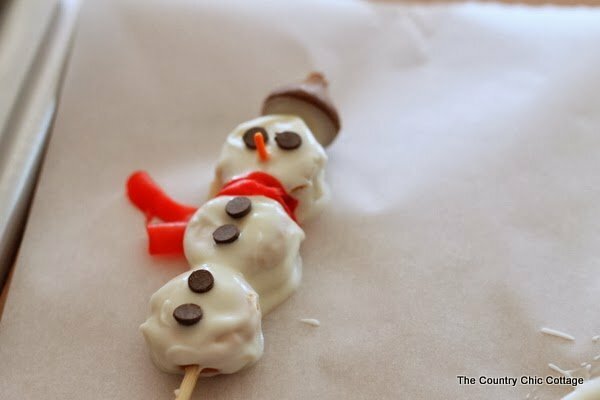 Alright y’all it is day 1 of Craft Lightning and I am kicking things off with my 10 minute snowmen treats. If you are new here, Craft Lightning is where myself and Carolina from 30 Minute Crafts host a quick and easy craft event. We will each post a project that takes 15 minutes or less each morning and each afternoon we will both do a round up of fun quick and easy crafts from our blog friends. Would you like to be featured here one afternoon this week? Be sure to link up your quick and easy holiday crafts to our Craft Lightning linky party. 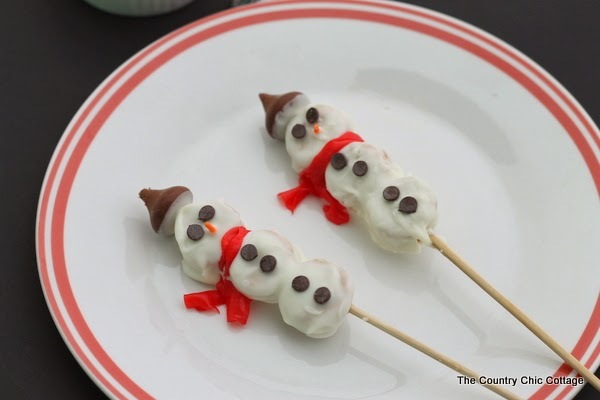 Lets make some quick and easy snowmen treats today.If you have missed any of the fun this week, be sure to catch up with the round ups from day 1, day 2, day 3, day 4, and day 5. Start with mini Nutter Butter cookies and a skewer. As you skewer through your cookies, they will split in half as shown below. Don’t worry I have a fix for this! Melt some white candy coating (or almond bark) in the microwave according to the package directions. 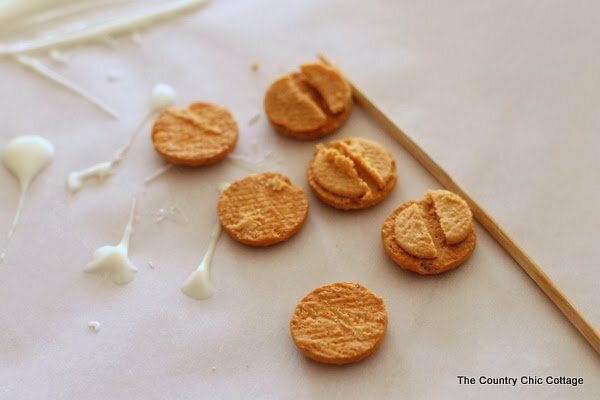 Add a drop in between each Nutter Butter cookie. 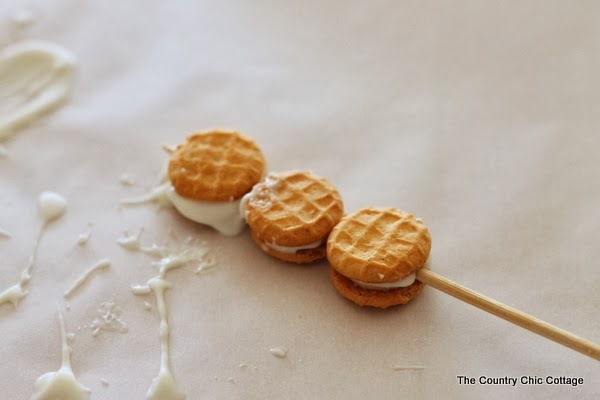 Sandwich cookies with skewer in between. Be sure to leave a bit of the pointy tip out of the top for his hat. Coat the entire stack of Nutter Butters (front and back) with the white candy coating. While still wet, add mini chocolate chip eyes, an orange sprinkle nose, and a fruit roll up scarf. Dip a Hershey’s kiss in the white candy coating and push into the skewer at the top for a hat. Allow to dry and these are ready to serve. 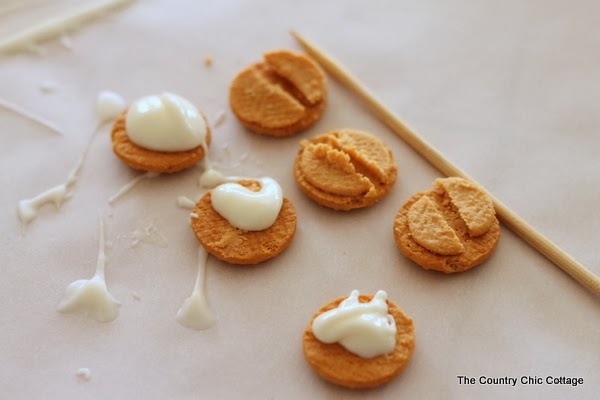 These quick and easy holiday treats are perfect for classroom projects or a rainy day. 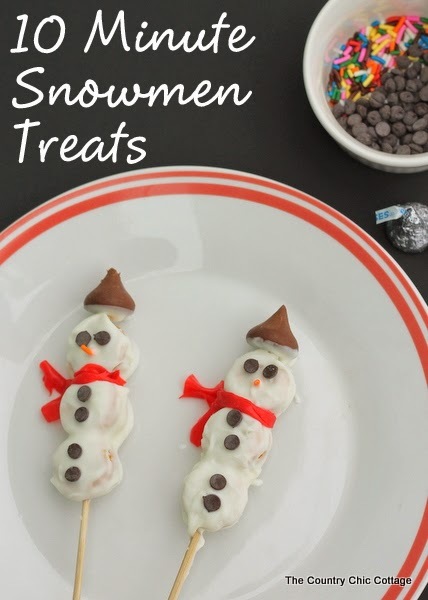 Be sure to make some of these 10 minute snowmen treats with your kids. previous post: Craft Lightning Holiday Edition — link up your quick crafts!